As the fall is coming, it is the great time to play outer door, camp ,fishing , climbing. ok, wait ...Do not forget your little fur kid.I am going to try and make the shark pet tent for my little friend ! So fun! 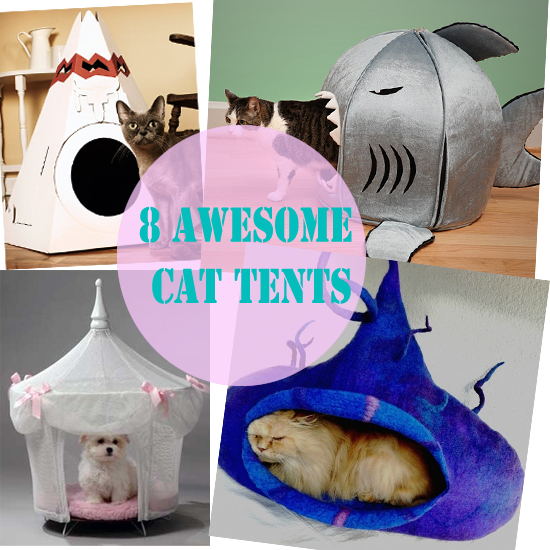 Check out my cat tent picks below,not only for shopping list, but also great idea for DIY. I so love the color, and the shape,although i have no idea how to DIY this wet felted cat pet. That is so amazing ,magic style, and it looks so warm,that is not just only a play cat pent ,i also could be cat bed.My kitten will love this one ,I bet. That is totally OMG!Every time your kitten go in and out, it'll look like a fat, bitchy shark is both eating and then spitting out small house pets. AWESOME! You could buy this shark cat pet from amazon, they provide two sizes, and said which is somewhat "Japanese Nanotechnology". whatever. Or, you could have a try to DIY one these cute thing, maybe upgrade it, what about a fierce giant mice, with sharp teeth ? Cute ! Fish cat ! Totally DIY idea . Before move to the sewing machine , you should to know that there is customize service on etsy: patterns4you provides instructions and paper pattern pieces to make pet beds. or you can order one from amazon here now. This is princess style pet tent bed, only for your cat lady.Your kitten is sure to feel like royalty in these cozy, private Pet Tent Luxury Dog Beds.Check amazon link to order one.